You may have seen signs in the area about an upcoming cleanup at the Mapleton Preserve for the National Day of Service in honor of Martin Luther King, Jr. The D&R Canal Commission has the following information about this event on the calendar on its website. 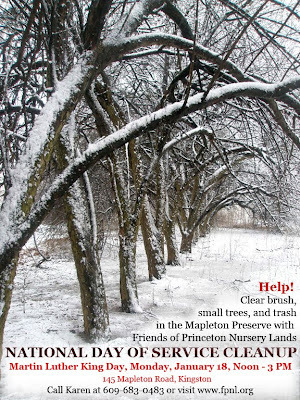 Join members of the Friends of Princeton Nursery Lands for an invigorating Cleanup Day at Mapleton Preserve from 12:00–3:00 pm! We will be clearing small trees, brush, and trash around the historic Propagation House and the Flemer Arboretum in preparation for our ARBOR DAY EVENT to be held later in the spring. Volunteers are asked to bring tools such as saws, clippers, loppers and rakes. Dress for the weather, whatever it is. This is your opportunity to take part in this second National Day of Service in honor of Dr. Martin Luther King. It is free and all are welcome. In case of extreme weather, the event will be postponed until Saturday, January 23, 2010 (from 12:00–3:00). For more information, see www.fpnl.org or call 609-683-0483. Interested participants can also sign up online here. This special program is sponsored by the Friends of Princeton Nursery Lands.